After Maggie Martin's husband dies and she uncovers secrets of his double life, she is ready for a new life. 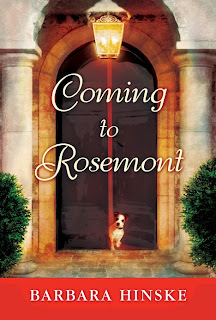 She inherits the estate known as Rosemont and when she travels to the Midwestern town of Westbury to sell it, she ends up falling in love with the beautiful fully furnished house and decides to make a fresh start there even if it means being away from her grown children. But soon, Maggie, who is a forensic accountant, becomes involved with the townsfolk to uncover political corruption and embezzlement. She also discovers a new love and heads toward a new career. With its charming book cover, I was eager to dig into this book and into Maggie's new life adventure. I began reading and before long a few things became apparent to me. This is a self-published book that would have benefited from professional editing. The story unfolds with a lot of telling rather than showing and before long I became bored. The characters are pretty much one-dimensional, but I kept reading with the hopes that things got better. It didn't. I just could not get emotionally invested in this book. I liked that Maggie had a chance at a new start in life, especially in mid-life. She took a chance, befriended the townsfolk and found a new calling. She rallied to help with the financial problem of the town's dwindling pension fund. However, the way the story is written failed to move me, including the romance. I also felt uncomfortable with the amount of religious expletives and f-bombs in this book. This is the first book in the Rosemont series. After plodding through this one, I have decided this series is not my cup of tea. Note: This book is rated P = Profanity for religious expletives, crude language and f-bombs.